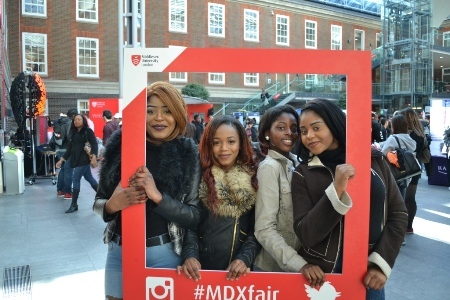 Over 2,000 students from across the capital were given an early insight into university life as Middlesex University played host to the 18th North London Higher Education Fair. The annual event, held on Friday 6 March, was a chance for prospective students from 22 schools across Barnet, Enfield, Brent, Haringey, Islington, Waltham Forest, Hammersmith and Fulham, Camden and Westminster to find out about courses on offer from over 65 universities. As well as presentations and talks from academics, students experienced live robotics performances, put their endurance to the test in a range of sporting activities and examined their own germs in a biomedical demonstration. During the event, students were also given a behind-the-scenes tour of Middlesex University exploring the Hendon campus' facilities, including the Sony-built TV studios and gallery complex, creative spaces, social and art studios, the gym and real tennis court. The career lounge was open for students to be given a personalised career profile, as they experienced what life is like at a university, taking a visit to the Students' Union, where they learnt about the diverse range of clubs and societies on offer. Workshops on subjects ranging from accounting and finance, maths, law, criminology and sociology journalism, nursing and television production and film were also held, giving students a glimpse into the variety of subjects on offer at university. The annual #selfie competition also returned this year with a large scale instant film frame touring the campus, encouraging prospective students to get involved and post their pictures on Twitter, with prizes on offer for the most creative shots. 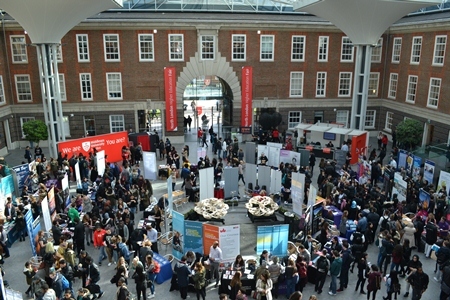 Middlesex University Education Liaison Manager Elita Eliades-Ahmed said: "Events such as this provide the rare opportunity for students to meet with universities across the length and breadth of the UK right on their doorstep. "It's an exciting time for year 12s but it can also be a difficult time, as they make one of their biggest decisions. We're passionate about giving them this opportunity to meet like-minded students in similar situations, alongside experts, so they are better informed to make those all important choices."